Feed Mill automation can simplify operation and improve efficiency of cost and throughput. Sterling Systems & Controls, Inc. custom designs and manufactures the highest quality automation control systems for virtually any Feed Mill process or a complete facility. Sterling Systems & Controls designs and provides equipment and software for custom systems using Allen-Bradley PLC’s and desktop PC’s running Sterling Systems’ customized Windows-based Automation Software. Sterling’s forty-five plus (45+) years of Feed Mill process and Feed Mill automation experience ensures quality and efficiency in both hardware and software. Sterling Systems & Controls, Inc. can automate your batching systems, whether an ingredient multiple scale system provided by us or any other vendor, or any type of weighing system for finished feed or feed in process. Our batching control systems improve the efficiency of your powder and bulk, or liquid, material handling process. We specialize in custom designed batching systems to increase performance, consistency, eliminate waste, combine dry and liquid ingredients, and provide unsurpassed production data collection and reporting capability. 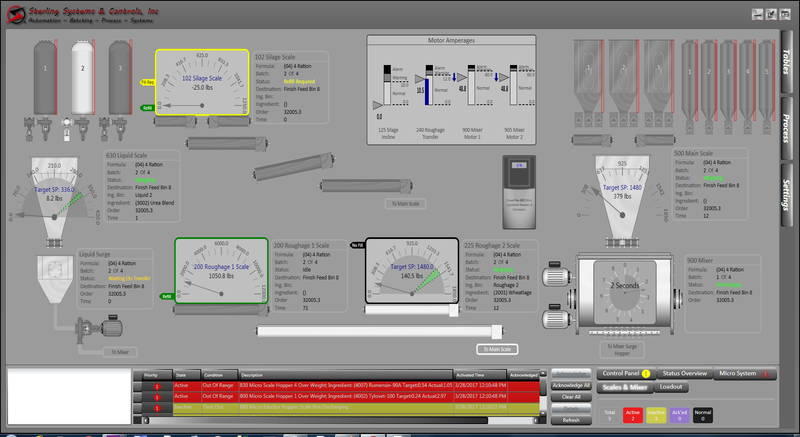 The main operator interface of the Sterling Systems’ batching control automation system is a desktop PC with Windows 10 operating system running the Sterling custom designed batching application as well as a custom database application. The PC and Sterling’ applications provide all control, data storage , and equipment status information necessary to run the batching process. 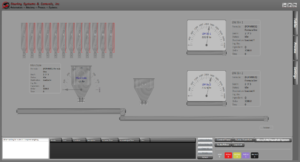 Access to the various screens, features and functions of the batching application, including Mixer control, is accomplished by using the pull out panels located at the right side of the screen. Most screens or features will be available as read-only and editing functionality will be available to a signed in user that has the proper operating privileges.